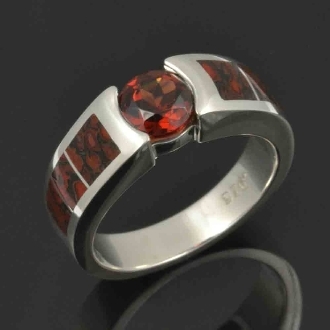 Red dinosaur bone engagement ring with a red garnet set in sterling silver. This dinosaur bone wedding ring or engagement ring is inlaid with 3 sections of red bone on each side of the center garnet. The 1.10 carat round Mozambique garnet is set almost flush, giving the engagement ring a sleek low profile. The garnet is a deep red color and looks great with red dinosaur bone inlay. The ring is 6.2mm wide at the top and tapers slightly down to 4mm at the bottom. The dinosaur bone used in this engagement ring is usually referred to as “gembone”. It is actually not bone but is a combination of minerals that have replaced the bone over time. Dinosaur bone is found in a rainbow of colors with the webbing color and cell size varying greatly from piece to piece. The varying cell size and colors creates some truly unique patterns and virtually one of a kind pieces of jewelry. Fossilized dinosaur bone can be composed of many different minerals including agate, jasper and calcite. The dinosaur bone color is determined by the combination of minerals present when the fossilized bone formed. Special orders usually take 4 to 6 weeks to complete so please schedule your order to allow us plenty of time to create your rings and ship them to you. Completion time: 4 to 6 weeks depending on the work load. **I recommend upgrading to Continuum sterling silver for all wedding ring or heavy wear jewelry. It will be much more durable than standard sterling silver and should extend the life of your jewelry.